AV Homes, Inc. founded in 1970, is best known for the development of Poinciana, an award-winning 47,000-acre master-planned community near Orlando. Today, the company is engaged in homebuilding, land development and other real estate operations in Florida and Arizona. Its principal operations are conducted at its 55+ active adult communities – Solivita near Orlando, and CantaMia near Phoenix. 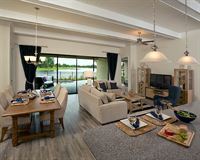 It also builds homes for people of all ages in Central Florida and Phoenix through its Joseph Carl Homes brand.